Sign up for our Cherry Thing email. 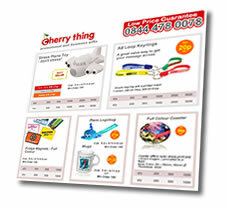 It's packed with great high quality, low cost promotional products aimed at all promotional budgets and promotion sizes. Be the first to get the latest Price Cuts across 1000's of products featuring all the industry favourite brands such as Senator, Prodir, Mid Ocean Brands, LogoBugs and Brite Mat and more. Think of buying today from our competitors? Ring us today and we'll offer you a lower price and a better deal.